KJ and Sharon Ellington were high school sweethearts. Growing up in Stem, NC, they were married in August of 2001. KJ attended Fruitland Baptist Bible College, where he discovered a burden on his heart for churches that struggle to keep pastors. 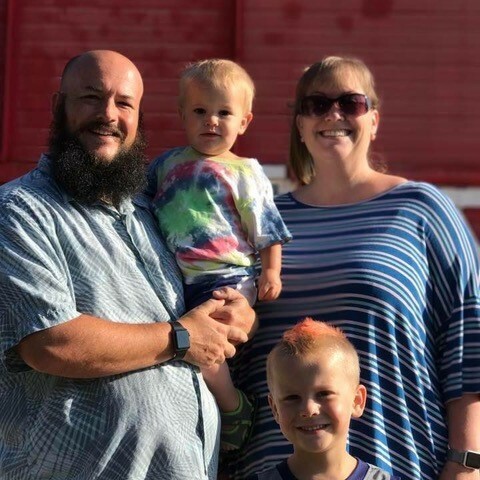 Introduced to Montana in 2005, while on a church mission trip to Manhattan, MT to help with one of the first outreach events held by the new church plant, Gallatin Valley Baptist Church, KJ quickly fell in love with the state. 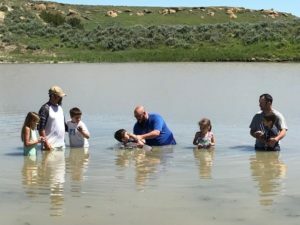 He began working with then Church Planting Team Leader, Dave Howeth, and started looking for a church in eastern Montana that had a need for a pastor. In the fall of 2005, KJ accepted a call to Jordan Community Bible Church. The Ellingtons moved to Jordan, MT just after Christmas of that year, and he began as their full-time pastor on January 1, 2006. Jordan has a population of 300 and is within a county the size of Connecticut. With the entire Garfield County having a population of just 1200, Jordan is known as the most isolated county seat in the lower 48 states! KJ proposed a vision to the church of “Connecting with God; Connecting with people; Changing the World.” This is the vision the church has since followed. There have been multiple opportunities to change the world simply by preaching and teaching to those who live in the community temporarily. Ranch hands, teachers, and others have attended church, been involved, matured or been saved, and then God has moved them to different places where they are even more involved in ministry and reaching others for Christ. One of the greatest challenges in eastern Montana is the distance between farms, ranches, and towns. Some travel up to an hour to come to church. Because of this, Jordan Community Bible Church has Sunday morning services followed by a potluck every week. That evening, they have youth group and Bible studies, such as evangelism and money management training. Church is truly a social area, as well as spiritual, and for many, this is the only day of the week that they are able to be in town. KJ says he enjoys his time in Jordan tremendously, he foresees being there for many years to come! Eight years ago, someone told him that pastors don’t stay long and, therefore, his opinion about community concerns doesn’t matter. Now, he is truly the community pastor. He notes that he “can’t walk to the post office without it taking 30 minutes because I run into someone or multiple individuals I know!” KJ has saved a quote from Miles City pastor, Jeff Cahill, that he uses to remind himself that ministering in smaller communities takes time. Pastor Cahill has observed, “In ag settings they will make a decision today and won’t know the results for 2-3 years.” It’s no different for a pastor. It takes time for a pastor to earn the trust and respect of the community. 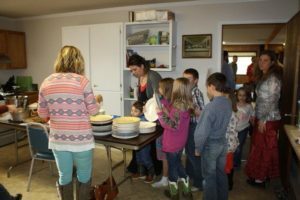 The small community church does several outreach events each year, including summer camp, VBS, Church in the Country, and Trunk or Treat. 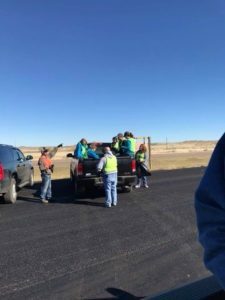 This year, they even were able to put a mission team together to build fences for three ranches that were devastated by the fires in 2017. They also host a Family Night twice a month, along with a game night and a movie night once a month. Being able to get families together and do outreach to the entire family is a huge part of the ministry. Although KJ is able to be a full-time pastor, he does several things to supplement his income. He fixes Apple products, helps others out in different ways, and works with the Montana Southern Baptist Convention on the Church Strategies Team. Because he makes himself available, God has been faithful and allowed him to spend time with ranchers and help those in the community. The Ellingtons struggled with infertility for ten years. This has given Sharon a very unique opportunity to reach out to others in the community who have gone through infertility or miscarriage. She hosts a private group where she has been able to guide these women to the love and compassion of Jesus. After 10 years of infertility, God provided a miracle; in 2011 Jeremiah was born, followed four years later by Elijah. KJ says his greatest prayer request is for a renewed desire for outreach and evangelism within the church. In the past year, nearly 10 people have stopped coming to church. His desire is to see those individuals, plus others, come back to church and be impacted by Jesus. He is now taking college courses and is set to graduate with his bachelor’s degree in May 2019. He is planning to earn his master’s degree at New Orleans Baptist Theological Seminary after that. He also asks for prayer that he and his family will continue to have excitement for the ministry that they are doing. He notes, “It would be easy, after almost 13 years, to become complacent and not look to reach those outside your circle.” KJ says he wants God to continue to stoke a passion in him for reaching those around him and doing the work God still has for him and Sharon in Jordan.